The Role of Nutrition for the Aging Population: Implications for Cognition and Alzheimer’s Disease. Power R, Prado-Cabrero A, Mulcahy R, Howard A, Nolan JM. Annual Reviews of Food Science and Technology. April 2019. Macular Pigment and Visual Function in Patients with Glaucoma: The San Diego Macular Pigment Study. Daga FB, Ogata NG, Medeiros FA, Moran R, Morris J, Zangwill LM, Weinreb RN, Nolan JM. Investigative Ophthalmology Visual Science. September 2018. Nutritional Intervention to Prevent Alzheimer’s Disease: Potential Benefits of Xanthophyll Carotenoids and Omega-3 Fatty Acids Combined. Nolan JM, Mulcahy R, Power R, Moran R, Howard AN. Journal of Alzheimer’s Disease. June 2018. The Relationship between Plasma Concentrations of Lutein and Zeaxanthin with Self-Reported and Actual Prevalence of AMD in an Irish population-Based Sample. Moran R, Beatty S, Stack J, O’Halloran AM, Feeney J, Akuffo KO, Peto T, Kenny RA, Nolan JM. Current Eye Research. March 2018. Plasma Lutein and Zeaxanthin are Associated with Better Cognitive Function Across Multiple Domains in a Large Population-Based Sample of Older Adults: Findings from The Irish Longitudinal Study on Aging. Feeney J, O’Leary N, Moran R, O’Halloran AM, Nolan JM, Beatty S, Young IS, Kenny RA. Journal of Gerontology, Series A Biological Sciences and Medical Science. October 2017. Phospholipid oxidation and carotenoid supplementation in Alzheimer’s disease patients. Ademowo OS, Dias HK, Milic I, Devitt A, Moran R, Mulcahy R, Howard AN, Nolan JM, Griffiths HR. Free Radical Biology and Medicine. March 2017. Non-Dietary Correlates and Determinants of Plasma Lutein and Zeaxanthin Concentrations in the Irish Population. Moran R, Nolan JM, Stack J, O’Halloran AM, Feeney J, Akuffo KO, Kenny RA, Beatty S. Journal of Nutrition Health and Ageing. March 2017. Relationship between macular pigment and visual function in subjects with early age-related macular degeneration. Akuffo KO, Nolan JM, Peto T, Stack J, Leung I, Corcoran L, Beatty S. British Journal of Ophthalmology. February 2017. Serum and macular response to carotenoid-enriched egg supplementation in human subjects: the Egg Xanthophyll Intervention clinical Trial. Kelly D, Nolan JM, Howard AN, Stack J, Akuffo KO, Moran R, Thurnham DI, Dennison J, Meagher KA, Beatty S. British Journal of Nutrition. January 2017. The evidence informing the surgeon’s selection of intraocular lens on the basis of light transmittance properties. Li X, Kelly D, Nolan JM, Dennison JL, Beatty S. Eye. December 2016. Enrichment of Macular Pigment Enhances Contrast Sensitivity in Subjects Free of Retinal Disease: Central Retinal Enrichment Supplementation Trials – Report 1. Nolan JM, Power R, Stringham J, Dennison J, Stack J, Kelly D, Moran R, Akuffo KO, Corcoran L, Beatty S. Investigative Ophthalmology and Visual Science. June 2016. Introduction of a Toric Intraocular Lens to a Non-Refractive Cataract Practice: Challenges and Outcomes. Kirwan C, Nolan JM, Stack J, Dooley I, Moore TC, Beatty S. International Journal of Ophthalmology and Clinical Research. May 2016. Lutein, zeaxanthin and meso-zeaxanthin: The basic and clinical science underlying carotenoid-based nutritional interventions against ocular disease. Bernstein PS, Li B, Vachali PP, Gorusupudi A, Shyam R, Henriksen BS, Nolan JM. Progress in Retinal and Eye Research. November 2015. Assessment of lutein, zeaxanthin and meso-zeaxanthin concentrations in dietary supplements by chiral high-performance liquid chromatography. Prado-Cabrero A, Beatty S, Howard AN, Stack J, Bettin P, Nolan JM. European Food Research and Technology. October 2015. Visual Function and Its Relationship with Severity of Early, and Activity of Neovascular, Age-Related Macular Degeneration. 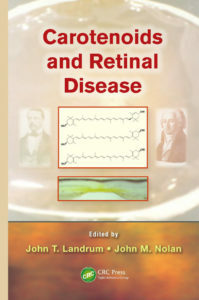 Loughman J, Sabour-Pickett S, Nolan JM, Klein B, Klein R, Beatty S. Journal of Clinical and Experimental Ophthalmology. October 2015. Cognitive Function and Its Relationship with Macular Pigment Optical Density and Serum Concentrations of its Constituent Carotenoids. Kelly D, Coen RF, Akuffo KO, Beatty S, Dennison J, Moran R, Stack J, Howard AN, Mulcahy R, Nolan JM. Journal of Alzheimer’s Disease. August 2015. Sustained supplementation and monitored response with differing carotenoid formulations in early age-related macular degeneration. Akuffo KO, Nolan JM, Howard AN, Moran R, Stack J, Klein R, Klein BE, Meuer SM, Sabour-Pickett S, Thurnham DI, Beatty S. Eye (London). May 2015. The impact of supplemental macular carotenoids in Alzheimer’s disease: A randomized Clinical Trial. Nolan JM, Loskutova E, Howard A, Mulcahy R, Moran R, Stack J, Bolger M, Coen RF, Dennison J, Akuffo KO, Owens N, Power R, Thurnham D, Beatty S. Journal of Alzheimer’s Disease. February 2015. Verification of meso-zeaxanthin in fish. Nolan JM, Beatty S, Meagher KA, Howard AN, Kelly D, Thurnham DI. Journal of Food Processing and Technology. June 2014. Central Retinal Enrichment Supplementation Trials (CREST): Design and Methodology of the CREST Randomized Controlled Trials. Akuffo KO, Beatty S, Stack J, Dennison J, O’Regan S, Meagher KA, Peto T, Nolan JM. Ophthalmic Epidemiology. April 2014. Regarding Macular Xanthophylls and ω-3 Long-Chain Polyunsaturated Fatty Acids in Age-Related Macular Degeneration. Meagher KA, Nolan JM, Beatty S. JAMA Ophthalmology. February 2014. Concordance of macular pigment measurements obtained using customized heterochromatic flicker photometry, dual-wavelength autofluorescence, and single-wavelength reflectance. Dennison JL, Stack J, Beatty S, Nolan JM. Experimental Eye Research. November 2013. What is meso-zeaxanthin and where does it come from? Nolan JM, Meagher K, Kashani S, Beatty S. Eye (London). August 2013. Investigation of Genetic Variation in Scavenger Receptor Class B, Member 1 (SCARB1) and Association with Serum Carotenoids. McKay GJ, Loane E, Nolan JM, Patterson CC, Meyers KJ, Mares JA, Yonova-Doing E, Hammond CJ, Beatty S, Silvestri G. Ophthalmology. April 2013. Secondary Outcomes in a Clinical Trial of Carotenoids with Coantioxidants versus Placebo in Early Age-Related Macular Degeneration. Beatty S, Chakravarthy U, Nolan JM, Muldrew KA, Woodside JV, Denny F, Stevenson MR. Ophthalmology. March 2013. Visual performance in patients with neovascular age-related macular degeneration undergoing treatment with intravitreal ranibizumab. Sabour-Pickett S, Loughman J, Nolan JM, Stack J, Pesudovs K, Meagher KA, Beatty S. Journal of Ophthalmology. February 2013. Serum response to supplemental macular carotenoids in subjects with and without age-related macular degeneration. Meagher KA, Thurnham D, Beatty S, Howard AN, Connolly EE, Cummins W, Nolan JM. British Journal of Nutrition. December 2012. The impact of macular pigment augmentation on visual performance using different carotenoid formulations. Loughman J, Nolan JM, Howard AN, Conolly E, Meagher K, Beatty S. Investigative Ophthalmology and Visual Science. November 2012. Impact of dietary carotenoid deprivation on macular pigment and serum concentrations of lutein and zeaxanthin: Letter. Loughman J, Nolan JM, Beatty S. British Journal of Nutrition. October 2012. Education is positively associated with macular pigment: The Irish Longitudinal Study on Ageing (TILDA). Nolan JM, Feeney J, Kenny RA, Cronin H, O’Regan C, Savva GM, Loughman J, Finucane C, Connolly E, Meagher K, Beatty S. Investigative Ophthalmology and Visual Science. November 2012. Profiles of Macular Pigment Optical Density and Their Changes Following Supplementation with Lutein and Zeaxanthin: Letter. Nolan JM, Beatty S. Investigative Ophthalmology and Visual Science. September 2012. The Heritability of Macular Response to Supplemental Lutein and Zeaxanthin: a Classical Twin Study. Hammond CJ, Liew SM, Van Kuijk FJ, Beatty S, Nolan JM, Spector TD, Gilbert C. Investigative Ophthalmology and Visual Science. July 2012. Macular carotenoid supplementation in subjects with atypical spatial profiles of macular pigment. Nolan JM, Akkali M, Loughman J, Howard A, Beatty S. Experimental Eye Research. May 2012. A review of the evidence germane to the putative protective role of the macular carotenoids for age-related macular degeneration. Sabour-Pickett S, Nolan JM, Loughman J, Beatty S. Molecular Nutrition and Food Research. February 2012. Supplementation with all three macular carotenoids: response, stability and safety. Connolly EE, Beatty S, Loughman J, Howard AN, Louw MS, Nolan JM. Investigative Ophthalmology and Visual Science. November 2011. Macular Pigment: Its Associations with Color Discrimination and Matching. Davison P, Akkali M, Loughman J, Scanlon G, Nolan JM, Beatty S. Optometry and Vision Science. July 2011. 26th Hohenheim Consensus Conference, September 2011, 2010 Scientific substantiation of health claims: Evidence-based nutrition. Biesalski HK, Aggett P, Anton R, Bernstein PS, Blumberg J, Heaney RP, Henry J, Nolan JM, Richardson DP, van Ommen B, Witkamp RF, Rijkers GT, Zöllner I. Nutrition. June 2011. The impact of macular pigment augmentation on visual performance in normal subjects: COMPASS. Nolan JM, Loughman J, Akkali MC, Stack J, Scanlon G, Davison P, Beatty S. Vision Research. March 2011. Estimation of effective lens position using a method independent of preoperative keratometry readings. Dooley I, Charalampidou S, Nolan JM, Loughman J, Molloy L, Beatty S. Journal of Cataract and Refractive Surgery. March 2011. Visual perceptions induced by intravitreous injections of therapeutic agents. Charalampidodu S, Nolan JM, Ormonde GO, Beatty S. Eye (London). January 2011. Update on modifiable risk factors for age-related macular degeneration. Nolan JM, O’Regan SJ, Beatty S, O’Regan GE. Optometry in Practice. October 2010. Effect on refractive outcomes after cataract surgery of intraocular lens constant personalization using the Haigis formula. Charalampidou S, Cassidy L, Ng E, Loughman J, Nolan JM, Stack J, Beatty S. Journal of Cataract and Refractive Surgery. July 2010. The respective relationships between lipoprotein profile, macular pigment optical density, and serum concentrations of lutein and zeaxanthin. Loane E, Nolan JM, Beatty S. Investigative Ophthalmology and Visual Science. June 2010. Macular Pigment Optical Density in an Ageing Irish Population: The Irish Longitudinal Study on Ageing. Nolan JM, Kenny R, O’Regan C, Cronin H, Loughman J, Connolly EE, Kearney P, Loane E, Beatty S. Ophthalmic Research. June 2010. A “central dip” in macular pigment is related to age and cigarette smoking. Kirby ML, Beatty S, Loane E, Akkali MC, Connolly EE, Stack J, Nolan JM. Investigative Ophthalmology and Visual Science. June 2010. Augmentation of macular pigment following supplementation with all three macular carotenoids: an exploratory study. Connolly EE, Beatty S, Thurnham DI, Loughman J, Howard AN, Stack J, Nolan JM. Current Eye Research. April 2010. Macular Pigment and its contribution to visual performance and experience. Loughman J, Davison PA, Nolan JM, Akkali MC, Scanlon G, Beatty S. Journal of Optometry. April 2010. Apolipoprotein E genotype is associated with macular pigment optical density. Loane E, Mckay GJ, Nolan JM, Beatty S. Investigative Ophthalmology and Visual Science. January 2010. The Rationale and Evidence Base for a Protective Role of Macular Pigment in Age-Related Maculopathy. Loane E, Kelliher C, Beatty S, Nolan JM. British Journal of Ophthalmology. July 2008. Spatial Profile of Macular Pigment and its Relationship to Foveal Architecture. Nolan JM, Stringham J, Beatty S, Snodderly DM. Investigative Ophthalmology and Visual Science. May 2008. Diet and risk factors for age-related maculopathy. O’Connell ED, Nolan JM, Stack J, Greenberg D, Kyle J, Maddock L, Beatty S. American Journal of Clinical Nutrition. March 2008. Measurement of macular pigment using two different heterochromatic flicker photometers. Loane E, Stack J, Beatty S, Nolan JM. Current Eye Research. June 2007. The relationships between macular pigment optical density and its constituent carotenoids in diet and serum. Nolan JM, Stack J, O’Connell E, Beatty S. Investigative Ophthalmology and Visual Science. February 2007. Changes in macular pigment optical density and serum concentrations of its constituent carotenoids following supplemental lutein and zeaxanthin: The LUNA Study. Trieschmann M, Beatty S, Nolan JM, Hense HW, Heimes B, Austermann U, Fobker M, Pauleikhoff D. Experimental Eye Research. December 2006. Macular carotenoids and age related maculopathy. O’Connell E, Neelam K, Nolan JM, Au Eong KG, Beatty S. ANNALS Academy of Medicine Singapore. November 2006. Risk factors for age-related maculopathy are associated with a relative lack of macular pigment. Nolan JM, Stack J, O’Donovan O, Loane E, Beatty S. Experimental Eye Research. November 2006. Macular pigment and ocular biometry. Neelam K, Nolan JM, Loane E, Stack J, O’Donovan O, Au Eong KG, Beatty S. Vision Research. February 2006. Monthly consistency of macular pigment optical density and serum concentrations of lutein and zeaxanthin. Nolan JM, Stack J, Mellerio J, Godhinio M, O’Donovan O, Neelam K, Beatty S. Current Eye Research. February 2006. Macular pigment and percentage of body fat. Nolan JM, O’Donovan O, Kavanagh H, Stack. J, Harrison M, Muldoon A, Mellerio J, Beatty S. Investigative Ophthalmology and Visual Science. November 2004. The role of the macular carotenoids as a blue light filter and an antioxidant. Oxidative Stress in the Retina and Choroid. Springer, 2011. J Nolan and K Neelam. Nutrition and Vision. 2004; Butterworth-Heinemann, Oxford, UK. K Neelam and J Nolan. R Al Taie, K Neelam and J Nolan.